A woman who could not fulfill the dowry demands of her in-laws was stabbed and dumped in a field near her parental home. The parents had rushed the grievously wounded housewife to Sector-30 government hospital, Noida, and filed a complaint with the Dankore police three days ago. The woman’s parents later met the SSP Noida. Personal enmity seems to have come to the fore in the recently concluded Panchayat, Municipal Council elections and the ongoing civic body polls in the district. Several murderous assaults have taken place in the past few days. One person has been killed and several have been injured seriously in such incidents. With the arrest of two foreign nationals, including a woman, the South district police today claimed to have busted a gang involved in using cloned credit cards for purchase of jewellery in the Capital. The police also claimed to have recovered nine cloned credit cards of various banks and two passports from their possession. A court notice was today issued to the Rukmani Devi Jaipuria Public School for first appointing and then dismissing the services of the same teacher for the same post during the last three years. Children who eat junk food in cafeteria and other food joints are at risk of early onset of diabetes and heart disease. This has been stated in a project report prepared by Dr Anoop Misra from the All India Institute of Medical Sciences. The members of the All Haryana Power Corporation Workers Union staged demonstration at the sub-divisional offices of the Power Department today for two hours in support of the two-day strike by the employees of the Punjab State Electricity Board in protest against the decision of the Punjab Government to dismantle the PSEB and start the process of privatisation of the Board. Celebrated lyricist and filmmaker Gulzar launched Urdutehzeeb.com – the world’s largest Urdu web portal here today. Ahmed Faraz, the renowned poet from Pakistan, presided over the launching ceremony. Delhi Sikh Gurdwara Management Committee chief Paramjit today announced that he would hold a mass initiation ceremony in Islamic Pakistan during Guru Nanak birthday celebrations at Nankana Sahib. Differences between the Congress government and the party in the National Capital Territory of Delhi came out into the open today when the Chief Minister, Mrs Sheila Dikshit, walked out of a meeting, specially convened to discuss ways to improve coordination between the two. The first national function on ‘Mahavir Mahatma Awards’ and the Oneness Forum will be held at Vigyan Bhawan here on April 20. The vigilance team of Delhi’s night watch security has exposed a gang, which was engaged in showing blue films in Alka Cinema Hall in Sector-15, Noida. With the onset of summers, diarrhoea seems to have spread in Noida where about two dozen patients have been under treatment in the district hospital in last three days. Most of the patients had come from the villages and slum areas as in the past. IGNOU’s School of Agriculture is starting some vocational courses on cane and bamboo, the two agro-forestry resources with huge employment potential. A big procession was held to celeberate Ramnavmi. Procession started from Ram Vatika, Ramlila Maidan, Ajmeri Gate. It passed through Chandni Chowk. Executive committee of the All Delhi Chemists Association today asked the Delhi Government to levy VAT at the first point and on the Maximum Retail Price and warned of statewide strike from April 25, if their demand is not met. According to information, Mrs Santo, alias Sato, of Prem Puri town in Dankore, had married her daughter Saira Bano to Yasin, son of Din Mohd of Khurja Kot Mohalla on February 15, 2004. The in-laws started ill-treating Saira Bano for not bringing a car in dowry. Her family’s effort to resolve the matter through negotiations had resulted in Saira being subjected to more harassment. According to Saira lying in government hospital, Noida, her husband Yasmin had put her in a car for going to her parent’s house and said she need not come back to his house without a car or money to buy a car. Yasin’s elder brother Yamin and brother-in-law Yaqub were also with her in the car. On the way, all of them beat her badly and then stabbed her in the stomach. Subsequently, they dumped her in a field near her parent’s house adjacent to the power station in Dankore. Some villagers, who saw her lying in a pool of blood, informed her parents who rushed her to government hospital in Noida. The Surajpur police claimed to have solved the mystery death of a truck driver in Udyog Vihar four days ago by arresting another truck driver. 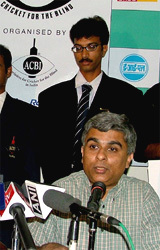 During interrogation, the detained driver Swedesh Sharma of Dankore has confessed that dispute over money is the reason behind the crime. He told the police that he had strangled Verinder, driver of truck (No HR38-BG5833). Five trucks loaded with fridge parts had come from Aurangabad for Videocon factory in Udyog Vihar in Surajpur on Friday night. Verinder’s body was discovered in his truck next morning. According to Swadesh Gupta, SO of Surajpur police station, police had come to know that Verinder had a dispute with another driver. When interrogated, the truck driver Swadesh Sharma confessed to having strangulated Verinder. In one of the recent incidents that took place last night, a college student was grievously injured after some persons attacked him with a sword at Sunped village in the district. The injured, identified as Tarun, a student of a local college, was admitted to Apollo Hospital in a serious condition. No arrest has been made so far. According to reports, the victim was sitting with his friends when a group of about four persons, carrying a sword and sharp-edged weapons attacked him. They allegedly tried to behead the student and his friends. While Tarun hit by the sword fell unconscious and started bleeding profusely, his friends also received injuries. It is learnt that half of the skull of the victim had come out before he was rushed to the hospital. It is alleged that this attack was the result of the enmity between two groups after the family of the victim did not vote for the candidate belonging to the accused, and as a result, that candidate lost the election, as claimed by some of the villagers. While the candidate supported by the victim’s family also lost, the victim family’s failure to vote for the accused reported to have enraged them. The two families involved in this incident are believed to be supporters of various political parties and the accused are reported to have been the supporters of the ruling Congress party. An old woman, a resident of Chawla Colony of Ballabhgarh, was killed after she had been allegedly beaten up by a candidate and his supporters contesting the election of the Municipal Corporation Faridabad, a few days ago. With the arrest of two foreign nationals, including a woman, the South district police today claimed to have busted a gang involved in using cloned credit cards for purchase of jewellery in the Capital. The police also claimed to have recovered nine cloned credit cards of various banks and two passports from their possession. The accused have been identified as Toe Koon San (32), resident of Kuala Lumpur and Mrs Ravindera Kaur Kukreja, resident of Bangkok. Acting on a complaint from an official of ICICI Bank that some foreign nationals were involved in purchasing jewellery in South Extension area by using cloned credit cards, a special team was formed to nab the suspects. Additional Deputy Commissioner of Police (South) Anil Shukla said that on April 17, a tip-off was received that two foreign nationals were trying to purchase jewellery by using credit cards. Accordingly, a police team reached the spot and detained the suspects. The police also recovered nine cards of different banks like Standard Chartered Bank, Bangkok, Best Bank, all issued in the name of Toe Koon San. Mr Shukla said that during interrogation, the accused disclosed that they had come to Delhi on April 13 via Bangkok and were staying in a hotel in Karol Bagh. Toe Koon San told the police that he received the cloned credit cards from one person identified as Chen, resident of Malaysia. After the purchase of jewellery worth Rs 5 lakh from different shops like Mehra Sons, Om Sons, Novelty Jewellers and Dev Raj Jewellers, Toe Koon San and Ravindera Kaur handed over the jewellery to Chen, staying in a hotel in the Karol Bagh area. Chen’s original name was later revealed as San Kar Tong who in turn passed on the jewellery to one Vir Wan, a Thai national. Toe Koon San also said that he worked in several restaurants in Kuala Lumpur and was later involved in betting of football matches. During this time, he suffered losses as he owed Rs 20,000 (Ringits) to one James, resident of Kuala Lampur. In order to recover the debt from Toe Koon San, James arranged for San’s trip to India and directed him to receive the cloned cards from a person for purchasing jewellery. Ravindera Kaur accompanied San as she owns a boutique in Bangkok and often comes to India for purchasing readymade clothes and other items. The police said that the scrutiny of the cards revealed that they belonged to some persons in the Netherlands and other European countries. James cloned these cards by using skimming techniques. Justice Vikramjit Sen of the Delhi High Court issued a notice returnable on May 13, 2005, to the management of the school and directed them not to terminate the services of the petitioner. It was pointed out that the school had first issued a letter of appointment to the petitioner on June 29, 2001, offering him appointment as PET (physical education teacher) and later issued a letter on July 2, 2001, appointing him as ad hoc PET till April 30, 2002. Later, he was given an extension and an appointment letter was issued on May 1, 2002, wherein the services were extended up to May 10, 2002. However, he was also served with a letter of termination of services the same day. The school advertised for the same post again and hired the petitioner, this time an appointment letter was issued on July 1, 2002 and his services were again terminated on April 30, 2003. This process of hiring and then terminating his services continued till July 1, 2004 when he was issued with an appointment letter indicating that his services will be terminated on April 30, 2005. It was brought to the notice of the court that the school in doing so was violating the fundamental rights of the petitioner as guaranteed to him under Articles 14, 16 and 21 of the Constitution. Furthermore, the advertisement for the post did not indicate that the job was on an ad hoc or temporary basis and that the practice of issuing appointment letters on ad hoc, temporary or contractual basis is nothing short of “exploitative practice taking undue advantage of the petitioner’s inability to resist”, the court was told. Social Jurists, a civil rights group on behalf of the petitioner sought the court’s intervention in directing the respondents to consider the case for regular appointment and pay him all its consequential benefits. Children who eat junk food in cafeteria and other food joints are at risk of early onset of diabetes and heart disease. This has been stated in a project report prepared by Dr Anoop Misra from the All India Institute of Medical Sciences (AIIMS). This is a research-based report prepared after talking to children of government and private schools. “About 33 per cent of schoolchildren eat out three or more times a week, irrespective of their economic status,” Dr Anoop Misra from the All India Institute of Medical Sciences and Convenor of the Diabetes Foundation of India said. The research involved 1,850 children in 18 Delhi schools, both from the private and government sector, he said. The two-year project, “Chetna”, is being launched to create awareness on healthy food and lifestyle among schoolchildren to avert the epidemic of diabetes and heart disease. The research, carried out by a team led by Dr Anoop Misra from the Department of Medicine, and Rekha Sharma, a dietician from AIIMS, also revealed that children are consuming more of pizzas, burgers, bread pakoras, samosas, sweets and aerated drinks. “What is the most harmful is the frequent consumption of chips, which are calorie-rich and have high levels of transfatty acid, one of the main culprit in development of these disease,” Misra said. Almost all paan shops sell these chips, which are now invading the eating habit of even rural population, he said. The study indicated that the intake of beneficial components in the diet of schoolchildren was much less than the required level while that of harmful ones was high, he said. “For example, consumption of monounsaturated fat, which has preventive effect, was only six per cent in daily diet against recommended level of 15 per cent,” Misra said. Saturated fat, which has a role in blocking arteries, almost touched the danger limit of 10 per cent, he added. Nearly 70 per cent of children in 10 and 12 classes were sedentary and 13 per cent of children had high levels of “C-reactive protein”, which is a robust indicator of heart problems, he said. The members of the All Haryana Power Corporation Workers Union staged demonstration at the sub-divisional offices of the Power Department today for two hours in support of the two-day strike by the employees of the Punjab State Electricity Board (PSEB) in protest against the decision of the Punjab Government to dismantle the PSEB and start the process of privatisation of the Board. The protest call was given by the National Co-Ordination Committee of Electricity Employees and Engineers (NCCOEE). The employees passed a resolution and sent its copy to the office of the Chief Minister of Punjab asking him to stall this move in the overall interests of the employees and the consumers. The NCCOEE has called upon the state level bodies of the employees union of the power department to oppose such moves by the various state governments and lodge their protest throughout the country. Celebrated lyricist and filmmaker Gulzar launched Urdutehzeeb.com – the world’s largest Urdu web portal here today. Ahmed Faraz, the renowned poet from Pakistan, presided over the launching ceremony. The ceremony took place at the Russian Cultural Centre, Ferozshah Road. Writers, journalists, educationists, intellectuals and important people from different walks of life attended the ceremony. Urdutehzeeb.com is catering to Urdu-speaking people all over the world. Over the last few months of test run, it has been getting several hundreds of thousands of hits from all over the world. There are 500 million people who speak Urdu. India has four times the number of Urdu-speaking people as compared to Pakistan. This language is spoken all over South Asia and even in Southeast Asian countries. A large number of Urdu-speaking people live in the United Kingdom, the United States, Canada and the Gulf countries. Urdutehzeeb.com is a project of Punjabi Millennium, which runs the immensely popular web portal, Punjabilok.com. Delhi Sikh Gurdwara Management Committee (DSGMC) chief Paramjit today announced that he would hold a mass initiation ceremony in Islamic Pakistan during Guru Nanak birthday celebrations at Nankana Sahib. Sarna told newspersons that his organisation would sponsor travel of Pakistani Sikh participants intending to visit their sacred sites in India. “There are around 4,00,000 Sikhs living in Pakistan and the planned Amrit Sanchar (initiation) in November is expected to attract maximum participation from Sindh,’’ Mr Sarna said. The DSGMC chief, accused by his critics of downgrading Sikhism’s key Amrit tradition by offering ‘cheap inducements’, instead called his opponents ‘ignorant’. “I had announced to fund Pakistan travel of passport-holding Indian Sikhs who participated in our Amrit Sanchar event in Delhi. Those who call this move a cheap inducement are themselves ignorant of Sikhism’s tenets,’’ Mr Sarna said. In 1699, Gobind Singh established the Sikh rite of initiation (called Khandey di Pahul or Amrit) by calling together over 80,000 Sikhs on Vaisakhi. He performed an initiation ceremony and created the Khalsa brotherhood. Five practising Sikhs, in the presence of Guru Granth Sahib, are authorised to initiate a newcomer into the faith. The Sikhs who have taken their vows are obliged to observe the tenets of the Sikh faith and lead a disciplined life. The DSGMC leader today also thanked both Indian and Pakistani governments for pledging an early start of a bus service between Amritsar and Nankana Sahib, the birthplace of Guru Nanak. Mrs Dikshit left the meeting within 15 minutes after several Congress MLAs criticised her style of functioning and accused the Chief Minister and her cabinet colleagues of not taking their views into consideration while taking decisions. Delhi Pradesh Congress Committee (DPCC) president Ram Babu Sharma, a known detractor of the Chief Minister, criticised Dikshit’s move. The meeting, attended by state Cabinet ministers, Congress MLAs and party MPs from Delhi, however, continued and decided that party in-charge of the state, Mr Ashok Gehlot, be involved in improving coordination. Delhi Congress has been ridden by factionalism for a long time. In the Congress Legislature Party meeting last month, an MLA opposed to Dikshit, had reportedly torn some papers and threw them at a minister. The return of the Sheila-led Congress for a second term to rule the NCT of Delhi had made her position considerably strong within the party and this was being resented by some local Congress leaders who were out to embarrass her. Spiritual guru Sri Sri Ravi Shankar, Vice-President Bhairon Singh Shekhawat, Home Minister Shivraj Patil, Defence Minister Pranab Mukherjee, Mr Soka Gakkai, a dignitary from Japan, Lok Sabha MP Milind Deora, industrialist B K Modi, Mr Mahammantra Das, musician A R Rehman are expected to grace the occasion. The purpose of the Oneness Forum, is to unite global humanitarian organisations for a collective action to save and transform mankind by social, political and spiritual awakening. Three persons, including the cashier of the cinema hall, have been arrested for exhibiting the banned films. The raid, which was conducted by the Delhi night watch security, has also raised questions on the role of entertainment tax personnel and the Noida police. The vigilance wing in-charge, Rakesh Kapur of the night watch security of Delhi, reportedly got the information about blue films being screened in the Alka Cinema. Mr Kapur reached the cinema hall with his team to watch a 3 pm to 6 pm show. Some blue film shots were being shown mixed with the film, “Pyar se Jism Tak”. Mr Kapur contacted SP Noida, M. P. Singh, and requested for help to conduct raid on the theatre. SP Noida ordered Sector-20 and Sector-58 police to conduct a raid on Alka Cinema. The police have arrested three persons during the raid on the Alka Cinema and seized four reels of films, including one of blue film. With the onset of summers, diarrhoea seems to have spread in Noida where about two dozen patients have been under treatment in the district hospital in last three days. Most of the patients had come from the villages and slum areas as in the past. And as usual, polluted drinking water in the area is the main cause of this disease, according to doctors. According to hospital sources, the number of patients of water-borne diseases are increasing day by day. Most of the patients are suffering from loose motions, vomiting and dehydration and trooping into the OPD of government hospital as well as some private nursing homes. Since the government hospital is short of beds, most of the patients are being sent back to their homes after check-up in the OPD and given doses of medicines and instructions on does and don’ts. But some of the more serious patients had to be admitted to the hospital. They were mostly from Harola and Hoshiarpur villages and slums in Sectors 8 and 9 Noida. Most of the serious patients were children from one to three years in age, Dr Akhilesh, on emergency duty in district hospital said. The season for the spread of water-borne diseases has come now. And diarrhoea is fast assuming the form of the epidemic, he said. Like past years, the quakes are making things worst for the poor people in slums as well as in rural areas. Instead of improving, the condition of patients invariably deteriorates with treatment by quakes. Poor people who have to drink polluted water from water pumps easily fall a prey to water-borne diseases, hospital sources say. IGNOU’s School of Agriculture (SOA) is starting some vocational courses on cane and bamboo, the two agro-forestry resources with huge employment potential. A big procession was held to celeberate Ramnavmi. Procession started from Ram Vatika, Ramlila Maidan, Ajmeri Gate. It passed through Chandni Chowk. The organisers of the procession were greeted atGurdwara Sis Ganj Sahib by the Senior Member of DSGMC Jathedar Surjit Singh Chandni Chowk. Executive committee of the All Delhi Chemists Association (ADCA) today asked the Delhi Government to levy VAT at the first point and on the Maximum Retail Price (MRP) and warned of statewide strike from April 25, if their demand is not met. “It is practically not possible for the chemists to keep an account of a large number of medicines at multiple points of VAT,” generalsecretary, ADCA, Kailash Gupta said.